The latest Bond is the perfect Bond Movie. Yes. It is. 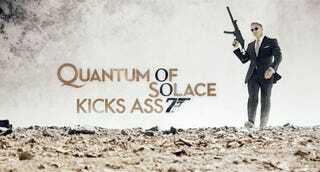 In fact, Quantum of Solace is not only the perfect Bond movie, it's the best Bond movie ever, period. Even surpassing Casino Royale-and I mean both the Craig's one and the original Peter Sellers, David Niven, and Woody Allen's delirium-which to me surpassed Connery's best (I know, sacrilege). It has everything a Bond film must have and more: Cars, cocktails, airplanes, boats, cocktails, smart hot girls, evil baddies, slimy baddie sidekicks, cocktails, and gadgets. Contrary to previous versions, the new Bond actually has some cool gadgets in it. I don't mean cheesy stupid mini-rockets firing from the exhaust pipe of an Aston Martin or laser watches that can cut through steel and french lingerie. I mean cool, believable technology that integrates in the movie transparently. To start with, real multitouch makes a stellar appearance with a giant Microsoft-Surface-style table which Judi Dench-the head of MI6-and other agents use with ease, simultaneously. In fact, the user interface on the table-albeit adorned for the required Hollywood eye candy-actually makes sense and is extremely attractive, gestures included. Everything on it is doable with current technology, even the part in which they place a dollar bill and it gets automatically scanned and identified. There's also the huge video wall at M's office. Unlike the multitouch surface, this is a CGI effect. However, with enough money and the use of transparent OLED technology and gesture recognition, the video wall is also perfectly doable. In fact, I saw something similar in my visit to Philips Labs last August, although that transparent video wall-a simulation of a glass storefront-used projection rather than OLEDs. Only a couple of technologies were exaggerated. One was Bond's cellphone camera capabilities-with 007 taking pictures of faces with 3D depth of field information from a very long distance. The other was the speed of data transmission between the cellphone and MI6's headquarters. However, you can perfectly imagine that all that may be real in the military world and just not available to consumers, specially looking at some of the latest camera and communications research. But what really makes this movie is not the technology. Yes, it plays an important role: Bond gets geolocation information on the baddies, and he uses his camera to get some of their pics, which then are analyzed and cross-referenced by MI6 databases. But none of it is a gimmick. There is no magic zippo lighter capable of launching kinetic rocket fire balls and save the day at the end of the movie. The technology in Quantum of Solace is realistic and it integrates naturally into the film, it flows with the plot. What makes it the best Bond movie ever is what makes an action movie good. The script to start with. Serious, but also witty, and with the right amount of reality stretching. It even has an underlying social theme, which is interesting and relates to the current world's political climate. Marc Forster's direction makes you wish he directed Indiana Jones IV. His movie runs like clockwork, with the action scenes being masterfully choreographed and filmed, and painting a deeper, much more complex portrait of not only Bond, but also M, who gets a lot more presence in this one (and is Judy bloody Dench. I rest my case). And then there is Bond himself. Daniel Craig really makes the movie work with his presence alone. He's a badass, but feels absolutely human. He has flair and a taste for luxury-wait until he arrives to Bolivia to see what I mean-but he gets gritty and dirty all the time. He could be a psychopath, but you can see that he has heart. He can seduce a women into bed like the best Connery would do, but you can actually see that he cares about her. You can feel that he is a hopeless romantic below the cold surface. A guy consumed by the need of vengeance and the contradiction of being betrayed by the love of his life. Yet, at the same time, he still loves her to the point of risking everything, even while she is dead. And he likes cocktails. Yes. Go. See it. Now.